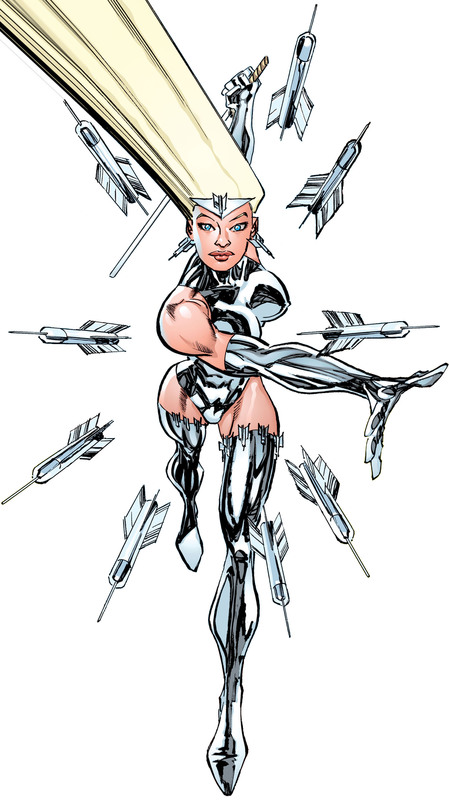 Powers: Dart has the powers and abilities of an adult female in top physical shape. She’s trained in a number of forms of martial arts and possesses an uncanny aiming ability that she utilizes with deadly accuracy. Alison Summers was the niece of the costumed vigilante known as Dart, a woman whom she greatly admires for her strong principles and her chosen career. She was recommended as an ideal babysitter for Angel Murphy for when her mother was on a mission for the United States government’s Special Operations Strikeforce. Back when Smasher was lost in the Darkworld timeline with Dragon, Alison Summers was responsible for taking care of her ward. Angel was distressed by her mother’s disappearance but was kept in good spirits by her babysitter whose words of comfort were well thought out. Alison Summers accidentally discovered that her grandfather was Sgt. Marvel and convinced him to train her in the martial arts. She soon became a skilled fighter and wanted to adopt the guise of her aunt, becoming even better than her as Dart. Alison arranged for Mako to locate the original Dart, ultimately leading to her death. Dart then murdered the man whom she had used to sell the location to Mako, framing the innocent Horridus for the crime. She also took part in the rescue of Angel Dragon by an army of heroes assembled by Dragon but took the opportunity to kill Sgt. Marvel. Dart then took possession of her grandfather’s God Sword and joined the Vicious Circle. In an effort to impress her new employers, Dart masterminded the abduction of both Malcolm and Angel Dragon. She was eventually defeated by Dragon and fled, being taken in by the unsuspecting Daredevil and the Little Wise Guys. Dart and Daredevil began a romance together but when her true nature was discovered by Jock, she killed the youngster and fled. She was finally confronted by Daredevil and the surviving Wise Guys but after her arrest, she escaped police custody and fled. She is next seen fighting The Tyrrus Combine during their invasion of Earth alongside Kill-Cat and Kid Avenger. Dart is next seen spying on Daredevil and The Little Wise Guys as they discuss the fact that they are not aging due to their blood. Due to this information she kidnaps and brutally murders the Little Wise Guys and begins to taste their blood stating that she wants to live forever. Dart, then begins to go after FirePower’s inner circle beginning with his loyal friend War Hawk, whom Dart murders by slicing him into multiple pieces. Dart then attacks a VC warehouse and murders many members of the Vicious Circle. She later orchestrates an attack on Stronghold Penitentiary in order to free members of the Vicious Circle. During the attack she encounters Mako whom she kills by slicing his head in half, finally overcoming her fear of him, but not before being bitten by him. She finally attacks FirePower the leader of the VC, kiling him and assuming control of the Vicious Circle. Dart later encounters Malcolm Dragon and makes him her target. She sends Red Rage to kill Malcolm, but Red Rage is defeated. She then orders Samurai to scour the city for him. She then berates her inner circle and threatens them with death if they don’t find Malcolm. After their failure to kill Malcolm she goes after Malcolm herself, but is quickly defeated after the pair brawl. Dart is later escapes jail due to her new found power of being able to turn into a shark due to her being bitten by Mako. She heads to Bellco to talk to Melvin Belco and is able to get something from him, but not before she runs into Malcolm and the two fight. She transforms again and the two are separated due to an explosion. She raids Bellco again and kills Melvin Bellco and regains her God Sword. However, she is shot with Freak Out and loses her shark powers and possible other powers as well. She later gets into a fight with Neutron Bob and Malcolm and is knocked out. However, she is taken away by Kill-Cat before she can be arrested, but quickly leaves his company. Dart continues to rule the Vicious Circle and even recruits Battle Dragon to her cause, as well as sleeping with him. She then sets out to kidnap Malcolm’s babies and succeeds and cuts Battle Dragon in half in the process. The babies are soon rescued by Malcolm who is able to even break Dart’s God Sword in the process. Dart soon runs into Battle Dragon whom she kisses before he explodes due to his blood transfusion with Malcolm’s blood. Due to this she is able to get caught and is arrested. Dart later escapes prison and takes her child that she had with Battle Dragon and goes to an unknown location.